Welcome to the first issue of the much delayed free E-Zine of Applied Sport Psychology. Members of this mailing list are automatically entered in a bimonthly drawing for a free Mental Training Tape from the Sierra Center for Peak Performance. It is our intention to provide short, easily read articles on Applied Sport Psychology to a select list of persons with an expressed interest in the psychological aspects of peak athletic performance. We hope to encourage an exchange of ideas and we seek to expand understanding of the basic concepts of Applied Sport Psychology among those persons with a desire to enhance athletic performance with appropriate and responsible techniques and methods. Your comments, suggestions and questions are strongly encouraged. The winner of the drawing for the free tape for this time period is Ms. Fernanda Santos of Portugal. Ms. Santos has 48 hours to claim her prize. The first four articles of this e-zine will be repeats for those of you that attended the Sport Psychology Clinic at Mt. Hood this summer. Please bear with us because there are many more articles beyond the first four. If you have photos from the Race Camp please contact Gary Beale at the address below so that we can obtain copies for posting to the Mind Games web site. "FROM BRAIN TO MUSCLE WITH A LOT LESS TUSSLE"
There are not many athletes who can honestly say that their performance is never affected by mental or psychological factors. Almost everyone who competes or attempts to do their best at some important aspect of life has experienced both mental boosts and hindrances. Doubts, confidence, anxiety, poise, courage and fears for example can have a significant impact on how well we perform. The more we understand the complex interrelationship between mind and body the more it becomes clear that in order to perform at our best physically we must properly prepare and use both body and mind. Research and experience have proven that structured scientific mental training can help us learn to prepare and use our mind to improve our competitive performance. A key psychological ingredient needed to consistently perform at our best is a winning attitude. In this context attitude is defined as those thoughts, beliefs, values, feelings and emotions associated with a specific situation or performance. For example the thoughts and feelings many alpine ski racers usually associate with a second run on a steep and icy slalom course is, for many of us, an overwhelming desire to finish the course! In general if we have doubts about our ability to finish we have trouble doing so. On the other hand if we have confidence we tend to be much more likely to stay in the course and finish successfully. There is a scientific basis for the commonly accepted axiom that confidence in the starting gate leads to successful races. The muscles of the body involuntarily and instantaneously respond to thoughts, feelings and ideas. This phenomenon is referred to as Ideomotor Activity. In practical terms what this means is that negative thoughts and emotions tend to have a negative effect on our muscles while positive thoughts tend to have a positive effect. In almost every situation of equal or nearly equal ability and preparation the winning racer is usually the one who maintains the most consistently positive attitude and pattern of thought. All athletic competitors can and should learn to shape their attitude and thought pattern into one of predominantly positive and confident thinking. The next article will tell you how to play positive mind games that will begin to shape your thoughts and emotions and help you create and maintain a more dynamic and effective winning attitude. Welcome to the second issue of the free E-Zine of Applied Sport Psychology. Members of this mailing list are automatically entered into a bimonthly drawing for a free Personalized Subliminal Tape from the Sierra Center for Peak Performance. The winner of the drawing for the free Personalized Subliminal tape for this time period is Mr. Carter Cue of Winston-Salem State College in Winston-Salem, NC. Mr. Cue has 48 hours to claim his prize. In most cases becoming a more successful competitor requires very specific behavior changes. For example, in order to consistently ski at the highest levels of your potential, you may need to run gates more often, eat better, modify tactics, improve technique or increase stamina. You can facilitate the process of behavior change by changing the way you think. Setting specific, positive, realistic and attainable goals is an off-snow "Mind Game" that improves on-snow performance. Effective goal setting starts with defining where you are now. Getting an accurate and objective assessment of present skills, abilities and deficiencies is the first step towards getting started in the "dry land training" of the basic skiing mind game. The help of a good ski coach or other qualified person who has watched you ski and race is invaluable and should always be a part of the assessment process. Your coach should help you set at least one short (Pre-Season), medium (Mid-Season) and long-range (End of Season) goal. You should also establish at least three steps that you must take in order to achieve each goal. Because the process of writing your goals and steps down on paper helps them to become more concrete and also helps you to become more committed to their achievement, you should always play this mind game with paper and pencil. You are more likely to take the steps to achieve your goals and experience success if you review your goals and steps on a regular basis. Once they have taken final written form, transfer them to something you can easily carry with you. Make it a habit to review them at least once before you practice or play. By reviewing them you will stay focused on what you must do to improve, be more aware of your progress and begin to establish a mental warm-up routine that puts you in the right frame of mind to bring out your best on the court. Get your "Goals and Steps Sheet" laminated and keep it in your ski bag or with your equipment so that you are always ready to re-focus your attention on what you must do to achieve your goals. Remember that your goals may need to be changed or modified as time passes and progress is made. Update them at least once every three months. The next section will tell you how to use your goals and steps to create positive statements, called affirmations, which will rapidly transform your attitude into that of a consistent winner. For a free Goal Setting and Affirmation Writing Workbook e-mail click here. Wouldn't a Two Tape Mental Training Program make a great gift for the holidays? We're offering a 25% Christmas discount to all members on our mailing list. Not a member? Click here and join. Welcome to the third issue of the free E-Zine of Applied Sport Psychology. Members of this mailing list are automatically entered into the drawing for a free Personalized Subliminal Tape from the Sierra Center for Peak Performance. The winner of the drawing for the free Personalized Subliminal tape for this time period is Mr. Steve Bell. Mr. Bell has 48 hours to claim his prize. (1) Be personal - (Use I, me, my, or your first name) "I AM RESPONSIBLE FOR THE INTENSITY OF MY PERFORMANCE. (2) Be positive - "I CONSISTENTLY STRIVE TO COMPETE AT THE HIGHEST LEVEL OF MY POTENTIAL!" (3) Use the present tense - "I AM CONFIDENT OF MY ABILITY TO BE SELECTED TO THE NATIONAL TEAM." (4) Phrase your affirmation as if the goal was already accomplished - "I AM IN IDEAL PHYSICAL AND MENTAL CONDITION." (5) Change yourself not the other person -"I STAY FOCUSED ON MY GOALS AND I AM UNAFFECTED BY THE BEHAVIOR OF OTHERS." (6) Do not compare yourself with anyone -"I AM TENACIOUS ABOUT DOING MY VERY BEST!" Avoid "I am more tenacious than Herman!" (7) Use action words - "I TAKE CHARGE OF MY THOUGHTS AND FEELINGS WHENEVER I TRAIN OR RACE." (8) Be realistic, but stretch - "I HAVE THE SELF-DISCIPLINE NEEDED TO CONSISTENTLY FINISH IN THE TOP THREE." (9) Use feeling words - "I LOVE THE FEELING I GET FROM COMPETING AT MY BEST!" (10) Avoid and eliminate - "I CAN..." or "I WILL..." or "I ALWAYS..." or "I NEVER..."
Affirmations do not have to be believed but they do have to be believable and repeated often to become internalized. When affirmations are stated and repeated with feeling they have the power to stimulate goal oriented action and focus attention on the successful mastery of critical tasks and skills. Affirmations, when stated aloud at least once every day, tend to gradually replace doubts and negative thoughts with feelings of confidence and positive self-esteem. They support and enhance internal dialogues that are consistent with successful goal achievement. Post your affirmations in conspicuous places that will cause you to notice them and encourage you to say them aloud often. If you make it a habit to say your affirmations aloud at least once every day, you will be amazed at their positive effect on you, your attitude and your performance. The next section will provide examples of effective affirmations and the goals and steps-to-achieve that they are based upon. Affirmations are powerful tools because they shape and focus our self-talk. Self-talk is that constant stream of words and sentences that circulate inside our head. The more we can influence our self-talk the more we can influence our attitude. Not aware of your self-talk? Click here for a free Self-Talk Log that is designed to help you become more aware of your own internal dialogue or here to see an example.. Welcome to the fourth issue of the free E-Zine of Applied Sport Psychology. Members of this mailing list are automatically entered into the drawing for a free Personalized Subliminal Tape from the Sierra Center for Peak Performance. The winner of the drawing for the free Personalized Subliminal tape for this time period is Mr. Jamey Smizer. Mr. Smizer has 48 hours to claim his prize. The list below gives examples of appropriate goals, steps and affirmations for alpine ski racers. With a little thought it should be easy to modify these examples to fit your sport or endeavor. Remember that at least one short (3 month), medium (6 month) and long-range (12-month) goal should be set in each category. Each goal and action step should be based upon what you must do to improve. It should also be noted that in most cases more than one action step is needed to assist the process of goal achievement. Only one action step is listed here because of space limitations. "I SAY MY AFFIRMATIONS OFTEN TO KEEP MY ATTITUDE MORE POSITIVE." "I LOVE TO SAY MY AFFIRMATIONS ALOUD AT LEAST ONCE EVERY DAY!" "I LOOK FORWARD TO WORKING OUT DURING THE SEASON TO INCREASE MY STRENGTH." "MY BODY FEELS SO MUCH BETTER WHEN I EAT THE RIGHT BALANCE OF PROTEIN, COMPLEX CARBOHYDRATES AND FAT!" "I AVOID FOODS WITH EXCESS FAT AND MY BODY LOOKS AND FEELS GREAT!" "I LOOK FOR WAYS TO EXPAND AND IMPROVE ALL ASPECTS OF MY TECHNIQUE." "I MAKE EVERY MISTAKE OR MISCUE A LEARNING SITUATION THAT IMPROVES MY RACING." "MY LINE IMPROVES AND MY RACING IMPROVES WITH IT." "I SKI MUCH FASTER WHEN I LOOK AT LEAST TWO GATES AHEAD." You can significantly magnify the effectiveness of your personal affirmations by having them transformed into subliminal messages that are projected just below the threshold of your conscience perception. Personalized Subliminal Tapes constructed in this way are extremely powerful tools for molding a winning attitude. Until March 1st, I am offering Personalized Subliminal Tapes made with your goals, your words and your music for just $63.99. This is a 20% discount off of the regular price. Visit our Totally Secure Order Site today and place your order. Welcome to the fifth issue of the free E-Zine of Applied Sport Psychology. Members of this mailing list are automatically entered into the drawing for a free Personalized Subliminal Tape from the Sierra Center for Peak Performance. The winner of the drawing for the free Personalized Subliminal tape for this time period is Ms. Emma Bear. Mr. Bear has 48 hours to claim her prize. Competitors can and should play a major role in guiding their own efforts to develop and use effective techniques and tactics and follow physical, nutritional and psychological regimens that will be most conducive to optimal performance on the slopes. A set of realistic and appropriate goals is a key ingredient needed to develop and use all of the powerful methods associated with Cognitive Restructuring. The use of a workbook specifically designed to assist the Goal Setting and Affirmation Writing Mind Game can be very helpful. The next section will offer practical methods of encouraging the habitual use of Positive Self-Talk and Thought Stopping. You can significantly magnify the effectiveness of your goals and personal affirmations by having them transformed into subliminal messages that are projected just below the threshold of your conscience perception. Personalized Subliminal Tapes constructed in this way are extremely powerful tools for molding a winning attitude. Because of the volume of the response and interest, I am extending the Personalized Subliminal Tape Offer until March 31st. I am offering Personalized Subliminal Tapes made with your goals, your words and your music for just $63.99. This is a 20% discount off of the regular price. Visit our Totally Secure Order Site today and place your order. Welcome to the sixth issue of the free E-Zine of Applied Sport Psychology. Members of this mailing list are automatically entered into the drawing for a free Personalized Subliminal Tape from the Sierra Center for Peak Performance. The winner of the drawing for the free Personalized Subliminal tape for this time period is Mr. Lamar Bagwell. Lamar has 48 hours to claim his prize. Keep a record of your thoughts during training as well as competition. Be especially aware of negative or self-depreciating comments. The next section will offer techniques that can be used to produce and encourage winning self-talk and eliminate self-defeating messages. The Self-Talk Log can easily be adapted to any sport or situation in life. Welcome to the seventh issue of the free E-Zine of Applied Sport Psychology. Members of this mailing list are automatically entered into the drawing for a free Personalized Subliminal Tape from the Sierra Center for Peak Performance. The winner of the drawing for the free Personalized Subliminal tape for this time period is Mr. Warren Jarrett. Warren has 48 hours to claim his prize. if circumstances allow, say it aloud. If not, say it to yourself. - think of and say an affirmation that is in direct opposition to the negative message. Say it aloud or to yourself. For example, if after inspecting the course you hear yourself saying or thinking "Oh No....the snow is really soft.....the ruts will be up to my waist!" you might use an affirmation like "I attack the ruts and use them to accelerate!" or "I ski much faster in the ruts and they give me an advantage!" - pause for a moment or take a "time out" from whatever you were doing when the thought occurred. Taking a break helps to weaken any association that may exist between the activity you were engaged in and the negative thought. By playing the Thought Stopping Mind Game you will more easily control and mold your own winning self-talk and experience good feelings and good performances more often. When you become a part of my "Virtual Private Practice" you gain, among other benefits, the opportunity to receive unlimited electronic consultation that will lead you to the most effective application of proven performance enhancing techniques such as Thought Stopping. Learning to use every tool available to you is one way to assure even greater success in your own personal pursuit of excellence. Order a custom built training program today and begin to master the psychological skills that help you to win more often. Welcome to the eight issue of the free E-Zine of Applied Sport Psychology. Members of this mailing list are automatically entered into the drawing for a free Personalized Subliminal Tape from the Sierra Center for Peak Performance. Aisha has 48 hours to claim his prize. Subliminal Reinforcement is one of the most misunderstood and underrated performance-enhancing tools of this decade. The word subliminal means, below the threshold of conscious perception. Subliminal Reinforcement is reinforcement that occurs below the threshold of conscious perception. If you have ever thought you heard the telephone ringing while running the vacuum sweeper and then turned the machine off to listen and discovered that the phone was in fact ringing, you have experienced subliminal reinforcement. The sound of the vacuum drowned out the sound of the phone-forcing it just below the threshold of conscious perception- but the ringing of the phone still prompted (i.e., reinforced) your desire to take action. Law of Concentrated Attention - whenever attention is concentrated on an idea over and over again, the idea tends to spontaneously realize itself. Repetitive mass media commercials used in advertising are typical examples of everyday applications of this law. Does anybody really believe that the Energizer Bunny keeps going and going and going? And yet the commercial does effect our purchasing behavior. Say your personalized affirmations aloud at least once each day. Listen to your personalized subliminal affirmations as often as possible. Subliminal reinforcement works at the level of the subconscious mind, and when the subconscious mind is repeatedly subjected to positive, goal-oriented affirmations you've written, the affirmations began to replace doubts and negative thoughts and transform your attitude into that of a consistent winner. The next section will further explain the power and effectiveness of subliminal reinforcement. Subliminal Reinforcement is an integral part of the tapes and training programs offered by the Sierra Center for Peak Performance. Visit our new order page and review our new training packages and pricing. And remember that as a subscriber to this ezine you will receive a 20% discount on all purchases. Welcome to the ninth issue of the free E-Zine of Applied Sport Psychology. Members of this mailing list are automatically entered into the drawing for a free Personalized Subliminal Tape from the Sierra Center for Peak Performance. The winner of the drawing for the free Personalized Subliminal tape for this time period is Zoila Torres. Zoila has 48 hours to claim his prize. Subliminal Reinforcement is a very powerful tool that can impact your thoughts and performance in very dramatic and positive ways. Properly structured personalized affirmations make the most potent subliminal messages. Earlier sections in this series demonstrated how you can create effective personalized affirmations using the goal setting and action step method. Once your affirmations have taken a final written form they can be used as the messages that are programmed onto personalized, subliminal reinforcement tapes. Research and experience has proven that in order for your affirmations to have an optimal effect on your level of motivation and competitive attitude they must be merged with music, or some other form of masking medium such as the sound of ocean waves, in very specific ways. For example, to be most compelling the volume of your subliminal affirmations must be maintained just below the hearing threshold and vary with the volume of the music. Your affirmations must also have a tonal quality that is free of the sibilants (hissing sounds) of the human voice. If these two basic modifications are not made the brain will track and block out the subliminal message much as it tracks and blocks out the audible hum of a fan or other distracting background sound that does not fluctuate. These two basic technical requirements can only be satisfied by the use of an electronic device. Carl Staub, a brilliant electrical engineer and president of a local company named Agtron, designed and perfected the device that I currently use. Carl's device electronically removes the sibilants, mixes the music with the affirmations and continually adjusts the volume of the affirmations so that no matter how loud or how soft the music becomes the affirmations are always just below the hearing threshold. Many athletes, and other persons who are committed to personal excellence, have reaped the benefits that personalized subliminal tapes and structured mental training can provide. Welcome to the tenth issue of the free E-Zine of Applied Sport Psychology. Members of this mailing list are automatically entered into the drawing for a free Personalized Subliminal Tape from the Sierra Center for Peak Performance. The winner of the drawing for the free Personalized Subliminal tape for this time period is Amanda Horne. Amanda has 48 hours to claim his prize. An ideal internal psychological climate exists for every athlete. When an athlete feels right - performance is right. The level of performance is a direct reflection of the way one feels inside. Performing towards the upper range of one's potential is a natural consequence of the right kind of internal feeling occurring at the right time. The elements of an ideal performance state are fundamentally the same for all athletes and all sports. The ideal performance state is most accurately described in terms of specific states of feeling experienced by individual performers. Competitive toughness is essentially the ability to create and sustain the ideal performance state regardless of the circumstances of play. One of the most direct ways of beginning to define your own ideal psychological climate is to use the power of your memory and imagination. I suggest that you do the following exercise in a darkened, quite room that is free from distractions and interruptions and has a comfortable place to recline or sit. Allow your mind to drift back to the most recent time when you performed near the top of your potential and everything seemed to be just right. See yourself and feel yourself performing again. Try to remember what you were wearing, where you were, who was watching or at the event supporting you, what odors were present, what taste you had in your mouth, what you saw, what you heard, what you felt with you hands, feet or other body parts and the emotions that you experienced. When the "Mind Movie" of you performing at your best is clear, open your eyes, turn up the lights and write down as many of the feelings or emotions from that time that you can recall. The list that you develop in this way will provide your first draft of what elements make up your own ideal, internal psychological climate. Once you have defined the elements that are present when you perform at your best you can then look for ways to generate, replicate, orchestrate and encourage those elements each time you compete or perform. Future articles will contain suggestions on how this can be accomplished. I invite you to e-mail your list to me and I will collect all of the elements mentioned and report the results in the next newsletter. I predict that there will be a high degree of duplication or similarity between competitors across sports. Please include in your e-mail your name and the name of your sport. Every person who provides a response will have their name entered into a special drawing for a free Standard Training Program. (A $69.00 value) The winner will be announced in the next issue of this e-zine. Welcome to the eleventh issue of the free E-Zine of Applied Sport Psychology. Members of this mailing list are automatically entered into the drawing for a free Personalized Subliminal Tape from the Sierra Center for Peak Performance. The winner of the drawing for the free Personalized Subliminal tape for this time period is Tom McDermott. Tom has 48 hours to claim his prize. Have you ever experienced any or all of these feeling states while competing? Do you think having these feelings present would help you to perform at your best? You can learn to bring on or orchestrate these and/or other feelings that are associated with your own best performance. Learning how to do this is at the center of most effective mental training programs. My next article will talk about how you can begin to master the skill of Voluntary Relaxation. Welcome to the twelfth issue of the free E-Zine of Applied Sport Psychology. To celebrate the one year anniversary of this E-Zine we are please to announce the presentation of a two part article by Sport Psychology Consultant, Karlene Sugarman. Karlene has a new book out and I encourage you to pick up a copy. The winner of the drawing for the free Personalized Subliminal tape for this time period is Ellen Puglisi. Ellen has 48 hours to claim her prize. In the flow, in a grove, on a roll, in the zone - whatever you call it, it's all defining one thing. It's that special feeling of playing like you can do no wrong and everything goes your way. You are so involved in what you are doing that nothing else seems to matter. When former Boston Celtic star Bill Russell characterizes being in the zone he says it is, "a moment when everything goes so perfectly that you slip into a gear that you didn't even know was there" (Greider, 1991, p. 17). Unfortunately, this doesn't seem to happen enough of the time. In fact, every time it does happen, it is usually by chance; you took no real active part in it. It just happened to be a day when everything fell into place, clicked for you, and you were "in the zone." Hopefully this occurrence will motivate you to do everything you can to have more peak performances. Since this is where we want to be - performing at a peak level more times than not, and not just by chance, you need to realize that you have control over whether this happens once in a career or more often. Baseball player Gary Carter describes it this way, "I think I could come to home plate, stand on my head, and still get a hit when I'm feeling like this" (Dorfman & Kuehl, 1991, p. 24). That sense of invincibility is vital because that complete confidence is what makes your body relaxed and your mind clear so that you can be in the flow. By implementing mental training skills, having a strong work ethic and being motivated to constantly improve, you can increase the chances of this transpiring on a more consistent basis. Being in the zone means doing more than anyone else thought possible, even superseding your own expectations at times. This zone is the definitive reason why many people are motivated to participate in sports. Think about a time when you were in the zone. It's the time when everything came together for you - it was exactly the kind of performance that you'd like to repeat over and over again. There was just a flow from beginning to end. "I'm in this quiet zone, I don't hear anything, and it enables me to use my inner peace and strength to go out and play," says former San Francisco 49er Defensive Back Marquez Pope. Peak performers have a strong sense of mission, enjoy the challenge, have the ability to stay focused on the goals and have unwavering confidence in themselves. What sets them apart is their burning commitment to themselves, their teammates and their goals. Peak performers in any arena, business or sports, are devoted to doing the best job possible. Adapted from Karlene Sugarman's new book, Winning the Mental Way, a book on team building and mental training. You can obtain your copy by sending $14.95 (add $3.00 shipping/handling). California residents add $1.08 for sales tax to: Step Up Publishing, 1312 Drake Avenue, Burlingame, CA 94010. For quantity discounts contact Step Up at 650-347-0826. You can also obtain a copy on www.amazon.com. Welcome to the thirteenth issue of the free E-Zine of Applied Sport Psychology. We are pleased to present the seeking of a two part article by Sport Psychology Consultant, Karlene Sugarman. Karlene has a new book out and I encourage you to pick up a copy. The winner of the drawing for the free Personalized Subliminal tape for this time period is Kenzie Patterson. Kenzie has 48 hours to claim the Personalized Subliminal Tape. Relaxed - The days of getting psyched up to play are over, the best performances occur when you are just slightly above your normal state of arousal, not at either extreme as once thought. You are energized, yet relaxed - it's a subtle balance of quiet intensity. Your mind is calm and your body is ready to go. You feel relaxed, but you are able to move with great strength and ease. Confident - You feel confident that no matter what you are up against, you're going to come out on top. You just exude with confidence and pride, and it's evident in your performance. There is no fear. You expect to be successful, not hope or wish to be successful. You have complete faith in your abilities. Completely focused - You are totally absorbed in the moment. You have no memory of the past and no qualms about the future. The only thing you are concentrating on is the task at hand. You're oblivious to everything else going on around you, consumed by the moment, and nothing outside can effect you. You have no real sense of time, and before you know it, the game is over. It seems to have flown by, yet everything you did seemed to happen in a slowed-down pace with great precision and concentration. Having the ability to stay in the moment is a gift that all of peak performers have. Effortless - Things just sort of happen with little or no effort whatsoever. You are in a state of mind and body where you can accomplish great things with little effort. The grace and ease that you display make everything you do seem like the simplest task in the world. You have a sense of finesse and grace, even when the task is very grueling and demanding. Automatic - There is no interference from your thoughts or emotions. Things are just happening, both without protest and without consent. You are on auto pilot - just reacting to whatever comes your way. Your body just seems to know what to do without any directive from you. There is no conscious thought; you're going strictly on your instincts. Fun - When you're in the flow, the enjoyment is incomparable to anything else. Anyone can see in your eyes the satisfaction and fulfillment the sport gives you. This is a key factor because if you don't enjoy your sport, your future in it will be limited. In Control - You feel that no matter what, you are in control. What you think and want to happen will. You have ultimate command over your emotions as well - you are controlling them, not the other way around. You govern your own destiny. When you feel this strong of a command over your game, great things are sure to happen. To be successful in sports you need to have your mind and body working with one another in perfect unison. If you are able to do this then you will experience the characteristics above and you too will be playing "in the zone." Welcome to the fourteenth issue of the free E-Zine of Applied Sport Psychology. Members of this mailing list are automatically entered into the drawing for a free Personalized Subliminal Tape from the Sierra Center for Peak Performance. The winner of the drawing for the free Personalized Subliminal tape for this time period is Abbie Maciolek. Abbie has 48 hours to claim the Personalized Subliminal Tape. As the New Year draws near, I would like to state my appreciation to all of you who have made the success of this E-zine and drrelax.com possible. In this arena, nothing is more valuable to me than the trust, confidence and participation of my friends, subscribers and clients. Your continued patronage is my most treasured asset. That's why I make this New Year's Resolution to continue to strive to exceed your expectations and preserve this most precious of blessings. So as I wish you the best in the coming year, I also want you to know how much I appreciate you! Research and experience has proven that structured scientific mental training can help you to improve your ability to voluntarily enter the Zone. Voluntary Relaxation and Visual Rehearsal are the basic skills that must be developed if entering the Zone "on command" is to be effectively achieved. Voluntary Relaxation is the ability to consciously calm the mind and body. Almost everyone would agree that the muscles of the body are more able to perform at their best when they are relaxed and that the mind can perform at its best when it is calm. You can train your body and mind to be more relaxed in response to predetermined cues given by you. You can then give these cues in any circumstance and, as a result of the increase in relaxation and concentration that will naturally occur, you will be more likely to be at your best both mentally and physically. The physical and mental mastery that is developed will greatly increase your ability to induce the Zone and more consistently perform at the top of your potential. The theater of your mind is the only place where you can practice perfectly every time. When you visually rehearse and you see yourself being successful you also build confidence and poise and prepare yourself mentally for the real-life, competition situation. You can learn Voluntary Relaxation skills through several different methods. biofeedback, Transcendental Meditation, Hypnosis and Guided Imagery are just a few of the many techniques that can be used. My personal and professional preference is to teach relaxation skills through the use of Guided Imagery. I prefer Guided Imagery because Visual Rehearsal skills can very easily be integrated into the process of relaxation training. Guided Imagery can be defined as the verbal presentation of scenes or images. It is very much like having a pleasant and sensory-rich, word-picture painted for you by another person. A good analogy that most of us can easily identify with is the experience of having stories read to us when we were children. Regardless of how you learn the skill of Voluntary Relaxation it is clear that to enter the Zone at will you must first master relaxation. If you have questions about Voluntary Relaxation and/or Visual Rehearsal please consider using a new feature of the web site called "Ask Dr. Relax." Just go to http://www.drrelax.com/ask.htm and ask your question. Everyone that does offer a pertinent, appropriate question will receive a 20% discount on the purchase of a training program or subliminal reinforcement CD or audiocassette tape. Welcome to the fifteenth issue of the free E-Zine of Applied Sport Psychology. Members of this mailing list are automatically entered into the drawing for a free Personalized Subliminal Tape from the Sierra Center for Peak Performance. The winner of the drawing for the free Personalized Subliminal tape for this time period is Julian Sellers. Julian has 48 hours to claim the Personalized Subliminal Tape. When your energy level is too low performance tends to be poor. When your energy level is too high performance is also depressed. But when energy and relaxation levels are moderate, or balanced, you more easily enter the Zone and optimal or peak performance is far more likely to occur. What is the practical application of this information? In general, to enter the Zone and perform at your best you should seek to balance energy and relaxation so that you are not too relaxed and not too energized. You should also develop the ability to regulate your level of energy because different levels of energy are required at different times during competition. For example, the energy needed in the huddle for a football player is vastly different than the level of energy needed for peak performance when the ball is snapped. It should also be noted that different sports have different energy requirement. 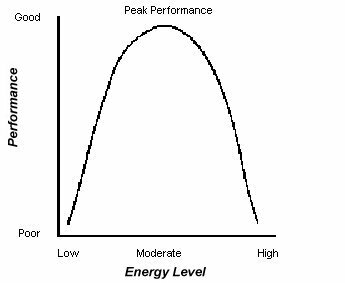 A "Peak Performance Curve" for a golfer should differ significantly from a curve that represents the energy that is required of a Power Lifter. The concept that is common among many athletes today is that you should seek to get "Pumped Up" or "Psyched Up" to perform at your best. Nothing could be further from the truth unless you are chronically under energized and too relaxed. If you seek to consistently enter the Zone and perform at the upper range of your potential you must learn to regulate your level of energy and relaxation so that you can keep yourself firmly balanced between low relaxation and high energy. The Mental Training Programs offered by the Sierra Center for Peak Performance guarantees your success at learning this vital skill. Welcome to the sixteenth issue of the free E-Zine of Applied Sport Psychology. Members of this mailing list are automatically entered into the drawing for a free Personalized Subliminal Tape from the Sierra Center for Peak Performance. William has 48 hours to claim the Personalized Subliminal Tape. Does Mental Training Really Help Enhance Performance? The following is a copy of a review that was published at PowerBasketball.com. It speaks to the question "Does Mental Training Really Help Enhance Performance?" and explains the web-based training process used exclusively by Dr. Relax from an independent observer's prospective. "I would like to personally thank Dr. Beale for allowing PowerBasketball to review his system and views on sports psychology. He brought back some much needed thoughts that I had forgotten when coaching my players under the pressure of winning basketball games. His views are concise and straight forward. His knowledge of sports psychology was impressive enough to warrant this review. His system requires the player to be focused enough to handle listening to a couple of tapes for approximately 30 minutes every evening and reading aloud the "affirmations" that he selects in the initial consultation with Dr. Beale. This consultation is done through an e-mail process so as not to disrupt the athletes full schedule. Dr. Beale will then reply with the initial proofs of the player's choices. The player is then held accountable to envision and learn relaxation methods that Dr. Beale teaches. Remember these affirmations are based on the individual athlete, no two athletes are alike. No program will be designed the same. The student athlete that I selected is a 15 year old sophomore playing varsity football and varsity basketball. He was one of a two starting quarterback rotation and the starting center. A very gifted athlete. His football season ended on a downside as the team lost their first playoff game and were eliminated from further post season play. Basketball season started up and his physical presence, 6'4" - 220 lb., was felt on the offensive and defensive boards. His defensive play was adequate and offensively he was in a slump. I would see Richard on a daily basis in class and he would explain to me the situation of his game. He was used to being a leader on the team and was feeling stifled on the offensive end. His confidence was low and his self esteem as a premier player was dropping. Enter Dr. Beale's program. The idea of having Richard in my class 5 days a week for a minimum of 60 minutes a day fit very well for TAPE TWO. AS he already worked at a computer everyday, it was extremely easy to get him to listen to his favorite CD. The catch was that Dr. Beale would prepare the CD with subliminal suggestioning as Richard had selected his affirmations. The difficult portion was TAPE ONE, Dr. Beale indicates that the athlete should have a quiet area to relax themselves and provide themselves with the proper imagery for the tape to work. I explained to Richard that he should listen to the tape every night 30 minutes before going to bed and also read aloud his affirmations as directed by Dr. Beale. The results did not take long. After two weeks of listening and relaxing, his game improved. He handled the pressure better. He was able to understand his role on the team better. He could knock down the free throws when we needed them. He had become a more complete player. I asked Richard to describe the feelings he had after a game. His comment was "I don't know I just feel more relaxed on the floor. The tape and CD must really be working." Richard has continued to use the combination of CD during class and imagery at night over the last 8 weeks and it has worked. His scoring is up, rebounding is up, play time is up, every part of his game has improved. Dr. Beale's system has worked just like the "Dr. ordered". To bring this review to conclusion, I would admit that I was skeptical about the whole subliminal suggestion process. It doesn't bother me anymore. Dr. Gary Beale has shown me and my student athlete just what the mind can do to control the physical part of a game. Thanks, Gary." Welcome to the seventeenth issue of the free E-Zine of Applied Sport Psychology. Members of this mailing list are automatically entered into the drawing for a free Personalized Subliminal Tape from the Sierra Center for Peak Performance. The winner of the drawing for the free Personalized Subliminal tape for this time period is Karen Hill. Karen has 48 hours to claim the Personalized Subliminal Tape. EXPANDING THE CONCEPT OF "THE ZONE"
The following article was offered by Sam Hirschberg, Senior Editor of TeamMastermind.com's free newsletter and explores the concept of getting into the Peak Performance State from a slightly different prospective. I think that you will find it relevant and interesting. Strength is made of five important components. You need a unique combination of these five strengths working together to excel in your sport of choice. You need an entirely different set of strengths as a basketball player than you need as a linebacker in football. The strength of a marathon runner doesn't even compare to that of a linebacker. World record holder Maurice Green counts on his strength to ignite his body off the line in the 60-meter sprint. Oscar De La Hoya relies upon his strength to persevere through a 12-round fight. Jerry Rice's strength has led him to be the top wide receiver in football history. Strength is the universal requirement of all athletes in every sport. Strength is the essential ingredient to your success as an athlete. Strength is a misunderstood principle in the world or sports and athletics. Your development of strength must be carefully planned and executed. If not, you could be harming your potential rather than realizing it. Strength is not just a word that bodybuilders, powerlifters, and weightlifters toss around. Some strengths are less important than others as it relates to your sport. The common denominator among all peak athletes, is a higher than average level of sport-specific strengths. You must focus on developing the specific combination of strength required of your sport. Just as you need a combination to open a lock, you need to find your combination of strength to increase your potential as an athlete. The first step is to achieve a solid base of physical strength - limit strength. This is where a good coach, mentor, or trainer is invaluable to help you locate and build upon your weak areas. Limit strength is the amount of musculo-skeletal force one can generate for a single, all-out effort. This type of strength is usually built in the weight room. Although there are ways to build limit strength on the tennis court, football field, track, etc. An adequate level of limit strength must be developed to reach higher levels of speed strength, anaerobic strength, and aerobic strength. And as you make an increase in any of your physical strengths, your mental strength is raised because of an increase in confidence. Therefore limit strength is the foundation of an athlete. With too much focus on limit strength, one might end up adding 10 lbs. of muscle mass that could create problems - as tennis player Andre Agassi did a few years ago. And his career was hurt because of it as he slipped to number 142 in the world. When he committed to sport-specific muscle strength his career took off again. You probably want great limit strength in your calves and thighs (hamstrings and quadriceps), a strong upper body (yet not bulky), and a strong, flexible trunk (abdominal and erector muscles). Starting Strength -The ability to 'turn on' many muscle fibers (muscle cells) instantaneously determines your starting speed strength. Throwing a 100 mph fast ball is an activity requiring starting speed strength. Tennis players Greg Rusedski and Mark Phillippousses have tremendous starting speed strength that is very apparent in their 140 mph, and above, serves. Explosive Strength - Once your muscle fibers are 'turned on,' the ability to leave them on is a function of your explosive speed strength. The five-yard acceleration to a soccer ball is an example of explosive speed strength. Explosiveness occurs just after the 'starting' of an activity requiring speed. Linebackers in football, tennis players, and sprinters all require a high explosive speed strength. Linear anaerobic endurance - Linear means that the same movement is done repeatedly, like a weightlifter doing 10 repetitions on the squat rack. The ability to sustain all-out running speed, as Carl Lewis does in the 100-meter sprint, is an example of linear anaerobic endurance. Even the elite sprinters, like Carl Lewis or Ben Johnson, fatigue in the latter half of a 100-meter sprint. The degree to which they tire is a measure of their anaerobic endurance. Non-Linear anaerobic endurance -The ability to play tennis with exceeding explosiveness for the length of a tennis match is a measure of non-linear anaerobic endurance. The tennis players with the best five-set victory records have a high non-linear anaerobic endurance. Linear aerobic endurance - An example of an 'aerobic' activity is running a marathon, or rowing a boat. Any repetitive movement done all-out and recurrently, such as a running stride in a marathon, is a linear aerobic movement. Non-linear aerobic endurance - An 'aerobic' activity with frequent time interruptions, like in a fast paced soccer or basketball game. A non-linear aerobic activity can take place over a three-hour time frame with frequent stops and starts, which may be comprised of running, kicking, jumping, etc. "Do little things aggravate me?" Or "Am I easily frenzied?" "Am I able to concentrate single mindedly on the task at hand? "Do I say things to myself such as, 'If I don't start fast, I'll lose." Causing myself to lose focus easily. Because of the mental strength needed, sports can be up to 90 percent mental at the higher levels of competition. Not everyone will be competing at these levels, although most would like to achieve a higher level of success; which you will when you understand and train your five strengths. You can now earn a Free Personalized Subliminal Tape by simply referring other interested athletes like yourself. Just click here, place your first and last name in the body of the message and send. I will get back to you with the details on this easy, new way to gain help in your efforts to reach your peak with a powerful, personalized, subliminal tape. Welcome to the eighteenth issue of the free E-Zine of Applied Sport Psychology. Members of this mailing list are automatically entered into the drawing for a free Personalized Subliminal Tape from the Sierra Center for Peak Performance. The winner of the drawing for the free Personalized Subliminal tape for this time period is Glenn Ziesenitz. Glenn has 48 hours to claim the Personalized Subliminal Tape. Here is the second article offered by Sam Hirschberg, Senior Editor of TeamMastermind.com's free newsletter. It explores the concept of proper nutritional preparation and it, like the first, is both interesting and relevant. An explosive athlete requires a vastly different nutrition plan than an aerobic athlete. Although a successful nutrition plan has similarities from sport to sport, there are very important differences that must not be overlooked. In order to recover from intense workouts and still have enough energy for your training and competition, then you will need to carefully monitor your protein, carbohydrate, and fat intake. This is critical. If you are after high performance from your body, then you must feed it properly with the correct nutritional ratios specific to your sport. Now, based upon your sport, 90% of your success can be dependent upon your nutrition and only 10% reliant upon your training. So, regardless of your sport, the only way to increase your sport-specific muscle strength and properly recover from strenuous training is to supply your muscles with adequate amounts of protein. Preferably high quality and low in fat. High protein diets have been a fad as of late for people desperately trying to shed body fat. But beware, because too much protein can be deadly. An excess protein intake can do serious harm to your vital internal organs. Especially if you are not drinking plenty of water. So you must follow a carefully monitored nutritional plan. And disregard the well-meaning advice of in-laws and profit-minded infomercials. So, to maximize your body's recovery, and to have enough energy for your training, it is important that you plan your meals carefully. You cannot eat at any random hour. You need to plan your protein and calorie expenditure throughout the day and eat accordingly. For example, a meal prior to taking a nap should be low in calories and carbohydrates. But, if you are going to the gym, you should eat a big meal about 1 ½ - 2 hours before your workout. And remember, the calorie expenditure during competition can be more than 25% more than what's required of your training. And if you don't consume the correct calories, your chances for success will drop rapidly. "I need to eat five or six meals a day?" When you eat smaller, more frequent meals, you will keep your insulin levels (blood sugar) high. This causes minimal drops in energy levels. You'll also get protein to your recovering muscles often. Therefore you will recover from the previous workouts and training sessions faster and more efficiently. Also, body fat will not be stored. Instead it will be used as an energy source. Simply by providing your body with just enough calories, its need to store fat is reduced. Conversely, when you eat infrequently, your body recognizes a "famine" situation and is more apt to store fat for the next famine to come. This is by no means a complete listing of the proper foods to eat for your athletic endeavors. Because you are an individual, and only you know your body best, it would be wisest for you to experiment with your nutrition to find what works best for you. But remember, always do so under the close advice of a knowledgeable coach, trainer and a certified nutritionist that has an in-depth knowledge of your sports' energy and recovery requirements. These nutritional ratios will get you fueled for a long and healthy athletic career, now its up to you to find what your body responds to best. Welcome to the nineteenth issue of the free E-Zine of Applied Sport Psychology. Members of this mailing list are automatically entered into the drawing for a free Personalized Subliminal Tape from the Sierra Center for Peak Performance. The winner of the drawing for the free Personalized Subliminal tape for this time period is Josh Jones. Josh has 48 hours to claim the Personalized Subliminal Tape. Energy/Arousal Monitoring and Control - by mastering the skills of Voluntary Relaxation you will gain the ability to adjust your level of relaxation and find that balance of relaxation and energy that is most conducive to your own best performance. You will also be able to direct relaxation to those parts of the body that may be tense or tight. Mental Rehearsal - mentally rehearsing the performance that you are about to give is an excellent way to keep your mind on the process of performing well, reinforcing the expectation of a good performance and of "priming" the same neuromuscular pathways that you will use when you perform. Attitude Enrichment - saying your affirmations aloud, reading them to yourself and listening to your Personalized Subliminal Reinforcement Tape or CD are all outstanding ways of maintaining a positive attitude, blocking out negative thoughts and reinforcing positive expectations. A Predominance of Process Thinking - keeping your mind focused on the process of performing well helps to avoid distraction and the deadly sin of Outcome Thinking. Outcome thinking is particularly damaging because it takes your mind off those things that you must do to perform well. Outcome thinking must often leads to "Choking". My next article will help you to begin to construct an effective Psychological Pre-Competition Routine. Mind Games Mental Training Programs, among other things, are designed to help athletes establish and implement structured, scientific, effective and reliable Psychological Pre-Competition Routines. Click here to order a program that will help you establish a powerful routine that will help you get into "The Zone" and become a consistent Peak Performer. Welcome to the twentieth issue of the free E-Zine of Applied Sport Psychology. Members of this mailing list are automatically entered into the drawing for a free Personalized Subliminal Tape from the Sierra Center for Peak Performance. The winner of the drawing for the free Personalized Subliminal tape for this time period is Olivier Fedrigo. Olivier has 48 hours to claim the Personalized Subliminal Tape. The following suggestions are excepts from the case notes of my on-going work with a young figure skater, her coach and her circle of support. They are offered to help demonstrate how you can integrate a Mental Pre-Competition Routine into your present preparations to compete or perform. These suggestions were sent as a fax to the skater, her coach and her mother and came after the skater had mastered the basic, Mental Strength Building skills. I. Voluntary Relaxation - take deep, diaphragmatic ("Belly") breaths frequently even if you don't feel nervous. (In through the nose as you force your stomach out, hold your breath for a slow count of five, then exhale slowly through your mouth) Deep breathing is particularly important in challenging situations and just prior to competing. II. Mental Rehearsal - mentally rehearse every performance before you skate. Mentally Rehearse your programs at least three times each week. Always see yourself with perfect technique and execution; feel the satisfaction of success. III. Attitude Enrichment - say your affirmations aloud at least once before you perform. Listen to your subliminal music tapes as much as possible. When doubt or a negative thought occurs use Thought-Stopping: (1) Say "STOP!" aloud (2) Take a deep, diaphragmatic breath (3) Say a positive affirmation that is the opposite of the negative thought. (4) If you can, take a break from what you were doing when the thought occurred. IV. Process Thinking - Put you mind on the Process of skating well and avoid thinking about Outcome. If Outcome thoughts occur use Thought-Stopping to eliminate them. USE YOUR MENTAL ROUTINE AT EVERY COMPETITION! Do your hair and make up. As you finish look into the mirror, smile big and say aloud "Even Greater Success is Coming to Me!" Do your off-ice warm up and stretches. As you stretch say "Every Stretch I Make Takes Me Deeper And Deeper Relaxed." Walk down to the rink entry gate, take a deep breath and say, "Stepping Onto The Ice Is My Signal To Relax." Just before you step back onto the ice to perform take a deep, diaphragmatic breath and say "I Do My Best And I'm A Winner No Matter What!" Fill free to make up any mnemonic device (like "vee-map" or "Victory-map" for example) that will help you remember to always play these four Pre-Competition Mind Games. Prior to learning new psychological skills and initiating a consistent, structured Mental Pre-Competition Routine, this young athlete was considered to have a doubtful future as a competitor. She is at the present time considered to be one of the most successful and one of the best competitor that her coach is currently training. Try it and see if it works for you! Visit our New Site and Win a Complete Program! Win a complete Mental Strength Training Program (a $90 Value) by visiting our New Web Site! Click http://www.drrelax.com/link.htm to visit our new site then go to http://www.drrelax.com/critique.htm and enter the drawing by completing a brief evaluation. This is the easiest way to win a complete training program. Two winners will be selected and everyone who sends in a critique is eligible for a 40% discount on the purchase of a program. Enter the drawing today! This is a limited time offer. Welcome to the twenty-first issue of the free E-Zine of Applied Sport Psychology. Members of this mailing list are automatically entered into the drawing for a free Personalized Subliminal Tape from the Sierra Center for Peak Performance. CHOKING: WHAT IS IT AND HOW IS IT PREVENTED OR OVERCOME? It seems that every fall, with the beginning of Football Season, I begin to get calls from concerned parents. I have been inundated lately by calls and contacts from the parents of young athletes who are concerned about the negative reinforcement that their children receive from their coaches. Although I can do little to change coaching style, I can offer some insight into the general effects of punishment, negative reinforcement, on performance. Because punishment is such a prominent and widespread means of controlling behavior in our society we should not be surprised to find that many coaches use it. To eliminate or reduce mistakes many coaches simply punish the athletes who make mistakes. This negative reinforcement can come in many forms but often it is expressed as anger and screaming. When anger and screaming are the primary tools, fear of failure is usually the result. Because fear interferes with the optimal functioning of the muscles and organs of the body, players who develop a strong fear of failure are much more prone to choke under pressure than those who do not develop strong fears. Whether we get our fear of failure as the result of our coach's teaching style or some other source, choking is a phenomenon that seems to affect us all. It is something that most athletes, and others, experience at least once in their competitive careers. Almost all of us experience and talk about it but few of us have an operational definition for choking. My next article will continue the discussion of choking and explain more about how to prevent it and overcome it when it does occur. I wish to thank everyone who participated in the evaluation of our new site. Most of your comments were very appropriate and very helpful. The two winners, drawn at random, are Cam Smith and Adina Weinstein. Cam and Adina please contact me via e-mail to collect your prize. Thanks again to everyone who participated and remember anyone who submitted a critique can purchase a World Class Training Program at 40% off! Welcome to the twenty second issue of the free E-Zine of Applied Sport Psychology. Members of this mailing list are automatically entered into the drawing for a free Personalized Subliminal Tape from the Sierra Center for Peak Performance. The winner of the drawing for the free Personalized Subliminal tape for this time period is John Ryan. John has 48 hours to claim the Personalized Subliminal Tape. Choking can be operationally defined as a progressive deterioration of performance that the athlete seems unable to stop without outside assistance. Choking is thought to occur when physical arousal continues to escalate beyond the optimal level. This condition of over arousal, or being "Psyched up", causes an involuntary narrowing of concentration. Typically the focus of the choking athlete's concentration moves from a broader, external focus to a more narrow, internal one. An athlete in the process of choking usually has their attention move progressively from broad-external (the position of my teammates and the runners on base for example) or internal focus (what to do if a runner attempts to steal) towards a more narrow-internal focus (how bad I will feel if I let a runner score). Remember, we cannot eliminate choking altogether but we can reduce the probability that it will occur and slow or stop the process once it has begun. Have you ever choked? Would you like to learn the skills and tools that can help slow, stop or reduce the likelihood of choking? If so, please go to the secure order site and place your order. Let Dr. Relax help you gain the skills needed to avoid choking and get on the right track to even greater success and poise. Welcome to the twenty third issue of the free Newsletter of Applied Sport Psychology. Members of this mailing list are automatically entered into the drawing for a free Personalized Subliminal Tape from the Sierra Center for Peak Performance. The winner of the drawing for the free Personalized Subliminal tape for this time period is Virginia Jenkins. Virginia has 48 hours to claim the Personalized Subliminal Tape. HOW TO STAY FREE OF UNWANTED POUNDS OVER THE HOLIDAYS! Over the next few weeks you will be bombarded with tons of "holiday goodies." With all the holiday temptations, is there a way to avoid those unwanted pounds and still maintain existing lean muscle? Choosing the right combination of foods is the key to staying lean and free of any unwanted weight. Using the suggestions below you'll even learn how to drop a few pounds. There are a wide array of holiday foods you can eat that will keep you in competition shape and feeling absolutely fantastic during even the most difficult of times. So let's keep it simple; I want you to categorize your food into one of two categories; 1) Foods that promote the immobilization of fat (storage), and 2) Foods that promote the mobilization of fat (fat burning). Now, I'm sure you've heard all the confusion about eating fat to lose weight, or lowering your carbs for better health, or even eating an all-protein diet. It's enough to keep you eternally confused. So, what is the real answer? Insulin is the CEO, the conductor, or the maestro. Your main priority is this; to keep the average level of insulin injected from the pancreas as low as you can. Here's why. When you consume carbohydrates, they are broken down to glucose (sugar), and this raises your blood sugar. Insulin is then secreted by the pancreas to lower your blood sugar. But, in the process, insulin promotes the storage of fat. And, insulin also inhibits the breakdown (loss) of previously stored fat. Now, glucagon is also released from the pancreas into the bloodstream, but following a protein-rich meal. And here's the good news: glucagon promotes the mobilization of previously stored fat; so as you burn food reserves for your energy requirements between meals, high levels of glucagon will allow that energy to be derived from excess fat stores. Eating foods that aid the pancreas to release a combination of insulin and glucagon in a manner consistent with your goals is really the way to stay lean, healthy, and free of extra pounds. The next part of this article, which will be published in early December, will provide some practical guidelines and compare two people with vastly different styles of eating. Sam Hirschberg is a USPTA tennis professional, an ISSA certified trainer, and senior editor of RealAthlete.com's FREE monthly newsletter that goes out to athletes and coaches worldwide. Sam is also the author of "1 Athlete - 5 Strengths; Building the Ultimate Athlete Training Manual"
Welcome to the twenty fourth issue of the free Newsletter of Applied Sport Psychology. Members of this mailing list are automatically entered into the drawing for a free Personalized Subliminal Tape from the Sierra Center for Peak Performance. The winner of the drawing for the free Personalized Subliminal tape for this time period is Willy H. Fichter. Willy has 48 hours to claim the Personalized Subliminal Tape. Food digestion is highly taxing to your body. So, if you eat frequent, small meals, composed of lean protein and fruits or veggies, OR whole grain carbohydrates and fruits or veggies, you'll notice an immediate increase in your energy level, you'll drop excess body fat, and you'll feel your best virtually immediately! Apply these guidelines during the holiday season and you'll have no problem in staying lean and fit while everyone else is gaining more girth around the middle. And when all your well-meaning friends and relatives gorge themselves with heavy carbs and huge amounts of protein and fat during the holiday season, they will be amazed at your boundless energy! Welcome to the twenty fifth issue of the free Newsletter of Applied Sport Psychology. Members of this mailing list are automatically entered into the drawing for a free Personalized Subliminal Tape from the Sierra Center for Peak Performance. Vanessa has 48 hours to claim the Personalized Subliminal Tape. As a part of my first publication of the New Year and New Millennium , I would like to once again state my appreciation to all of you who have made the success of this Newsletter, doctorrelax.com and drrelax.com possible. Thanks to your support drrelax.com is ranked in the top ten in most of the major search engines and within the top 15 in all major search engines in the category of Sport Psychology.